I have been working like a dog (heh) and haven’t had much time for spinning. I keep a drop spindle at my desk at work to spin on during breaks or when I need to clear my brain (yes, I know there are tumbleweeds in there but still). This week, I was able to finish up the 4 ounce bag o’Shetland roving purchased at SAFF last year from Fleury Sheep and Wool. From their very own sheep and processed in their very own mill. I have some cool friends! 160 yards of squooshy worsted weight goodness. I’m hoping this will make a One Row Scarf designed by the Yarn Harlot. It will be for Bahhb. Poor man has plenty of socks, a sweater, hat and scarves, but nothing made from my handspun. We must feex it NAO. Well, after the hat for a friend is done and the baby gift is finished. Yup. 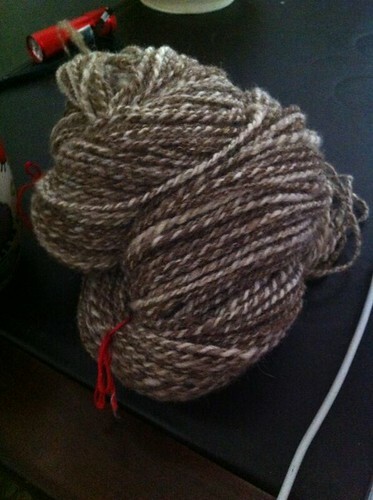 So, now I go back to spinning my brown roving from Giselle, the wonder fleece I bought in Rhinebeck. Over halfway done with the singles and then I can proceed with the plying. Hoping to have enough to make a beautiful cardigan, Eadon (Ravelry Link). I think this yarn will be perfect for it. I also have plans to finish up some 4 ounce braids of various wonderful rovings gifted to me. I will try to be good at the documenting and sharing of this as I proceed along. Happy weekend all. I hope we can all take a moment tomorrow to remember, and say a prayer for all those who have suffered at the hands of a few. I am grateful to be here, with a wonderful husband and family. Our company is still going (just celebrated 15 years) and I feel blessed to have all the excellent, caring friends in my life. Next Post:Look! A blog post! Purty! And I just put Eadon in my queue. Thanks! Congrats on the 15 years AND I can’t wait to see you at SAFF!!!! !